It has been over a day since the news was reported that the NFL handed down the disgraceful punishment towards Ray Rice and we have naturally seen some awful responses from it. Deadspin put together a great list of ESPN broadcasters that are carrying the league's water. But there was one reaction that is the worst and it came from First Take's Stephen A. Smith. However, his nonsense was absolutely destroyed by his colleague, Michelle Beadle. Let's take a look. I mean, there really isn't much to say about that. 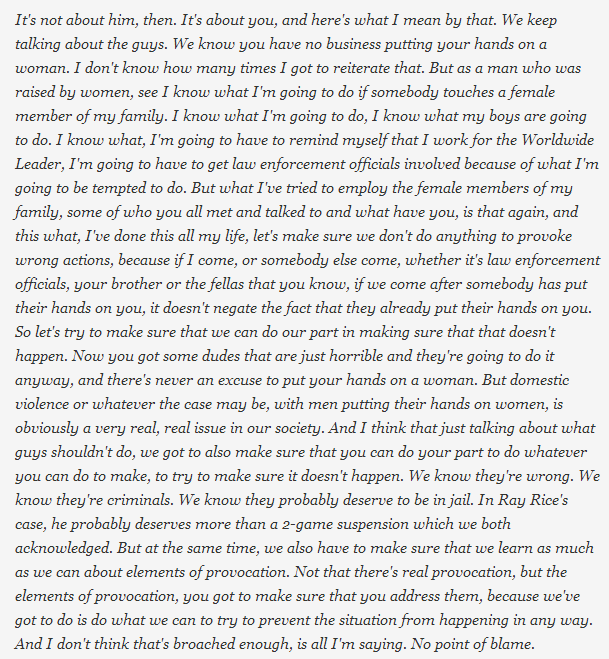 Smith is very clearly suggesting that women should not do anything that would provoke such an action. That's inane and offensive. And fortunately, Beadle felt similarly and boldly said on Twitter. Bravo, Ms. Beadle, brilliantly put. Of course, we know what happened the last time a high-profile ESPN personality and hopefully, that doesn't happens hear. For the record, Smith "tried" to explain his comments via his Twitter and reiterated his point while pulling the classic "I was misunderstood" defense. Hopefully ESPN does the right thing here and at the very least suspends Smith for his nonsense.